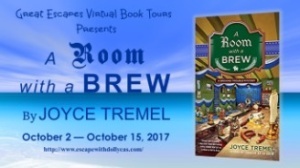 I’m happy to be celebrating the new release, A ROOM WITH A BREW, by Joyce Tremel with Great Escapes Virtual Book Tours! This third book in the Brewing Trouble series finds Max O’Hara, owner of the Allegheny Brew House in Pittsburgh, getting ready to host her first Oktoberfest celebration. The author manages to combine an exciting blend of cold war intrigue, oompah bands, tasty brews, a discovered priceless masterpiece, and murder. 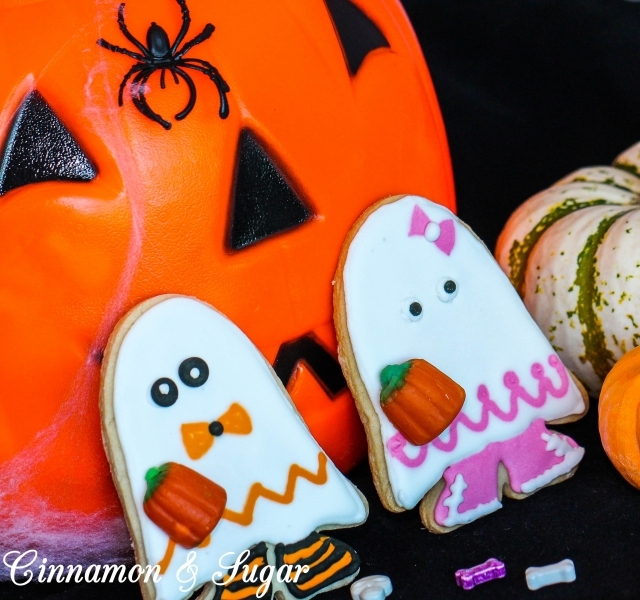 Max’s friend, Candy, a seventy-something old cupcake bakery owner, has had minor roles in the previous two books but in A ROOM WITH A BREW, she takes center stage. I’ve always been curious about Candy, but she’s always held her secrets close. This time, though Candy’s story is finally told and while I won’t provide any spoilers, she certainly has quite the tale to tell and kept me entertained! There are plenty of memorable supporting characters surrounding Max and as with Candy, I’m now curious about their own stories. I enjoyed the Pittsburghese expressions that are included, which adds to the authenticity of the location. For example, N’at is short for “and all that”. Fortunately for us Pittsburgh novices, the author provides translations. Aside from the memorable characters and the fun location, A ROOM WITH A BREW provides a well-plotted mystery with plenty of intrigue and suspects to keep the reader turning pages. Several subplots are woven into the story, adding to the enjoyment of this well-crafted tale! While reading this new book, it was hard to not get thirsty for a brew or hungry for a delectable dish. Ms. Tremel provides several recipes in the back of the book to keep your hunger at bay but unfortunately, you’re on your own for imbibing. 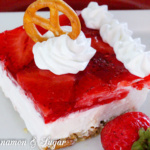 Back in my late teens and early twenties I had a recipe similar to the Pittsburgh Pretzel Salad ­­­­­­­recipe included in the book. Somewhere in my many moves in my younger days, I lost the recipe so was delighted to try it again. It didn’t disappoint and brought back many nostalgic memories from so many years ago. The crunchy saltiness of pretzels complements the creamy sweet tanginess of cream cheese. 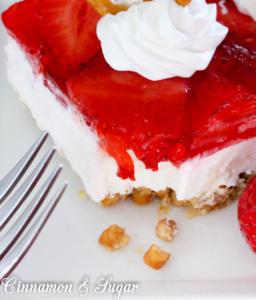 Juicy strawberries liven up strawberry jello for an appealing red layer, while additional whipped topping garnishes this cool, refreshing treat. 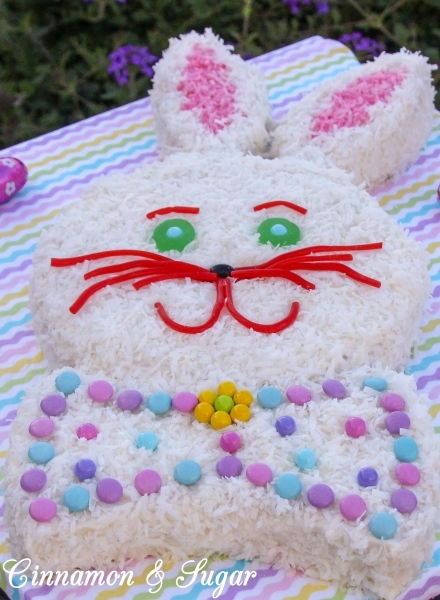 I’m very happy to be able to share this fun dish with my own granddaughters. Mix all the ingredients and press into a 9 x 13-inch pan. Bake for 8 minutes. Completely cool. Beat cream cheese and sugar until creamy. Fold in whipped topping then spread over cooled pretzel mixture. Chill for 30 minutes or until Jell-O for the top layer is thickened. Combine Jell-O with boiling water. Stir until dissolved, about 2 minutes. Chill until partially thickened, then spread over top of cream cheese mixture. 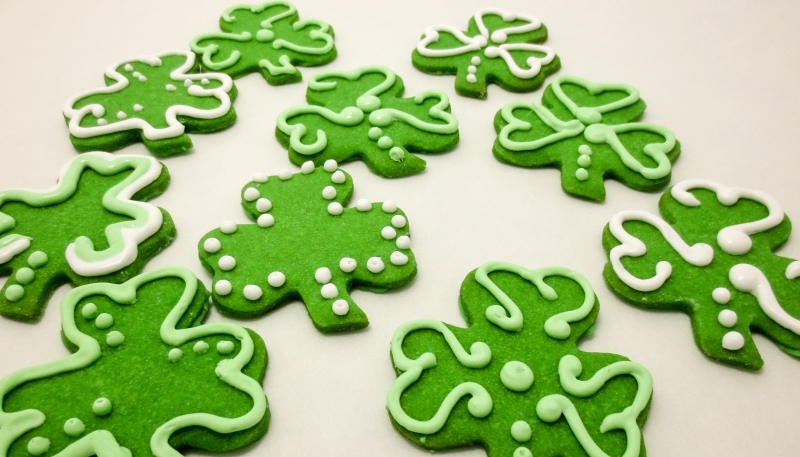 If desired, top with additional whipped topping and sprinkle with crushed or broken pretzel pieces. You can make half the recipe and use an 8x8-inch square casserole dish. The half recipe ingredients are listed in the video. I was provided a copy of this book with the hopes I would review. All thoughts and opinions are my own. 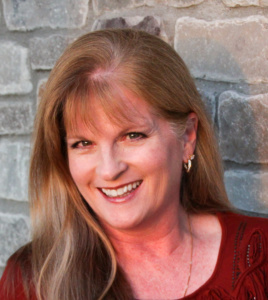 Question for Joyce Tremel: When you start a new book, do you have all the characters in place and an ending planned, or does it come to you as you write? Hi Peggy! My answer is “sort of.” Helpful, I know, lol. I usually write a loose one-page synopsis with the general plot and the core characters. I’ve tried using a detailed outline, but it doesn’t work for me. A lot of things surprised me as I wrote A Room With a Brew and the story changed a couple of times as I wrote it. There was one character in particular who appeared and surprised me. I hadn’t planned on him until he knocked on the door. It really fit the story though. 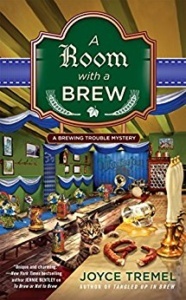 Though I have not come across this series, I love the idea of a brew house setting for a cozy mystery. 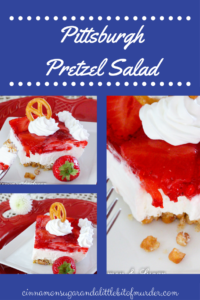 I don’t think I have ever come across the Pittsburgh Pretzel Salad and was fascinated to find that it seems to be a form of pie. Yum! I love this “salad,” and was actually looking for this recipe the other day, but couldn’t find one I liked. I think this one fits the bill. Looking forward to reading A Room With a Brew! Looks like a great read. I am looking forward to seeing how Max, Candy, and the Pittsburghese all come together. Appreciate the recipe idea. This salad is terrific, as is your “Brew” series! Thank you for the chance to meet a nee to me author. This Cozy looks like so much fun! I can’t wait to read it! There are so many good books being published right now but despite my tiny budget this one is on my list!!!!! The treat from above is a childhood friend of mine more or less. 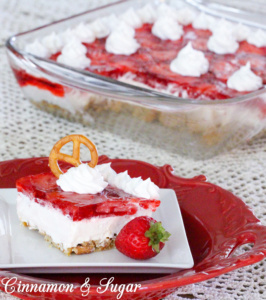 This type of dish with a pretzel crust is common pot luck and picnic faire here in Wisconsin. Yummy! I can’t wait to try your recipe either. love the recipe but had never heard it called that before! really looking forward to you new release! I believe you are a new-to-me author. The story sounds fun, and I look forward to reading it. Thaks for the recipe. I have never made this tupe of salad, but have eaten it. Was just the other day thinking I needed to find a recipe and make one. 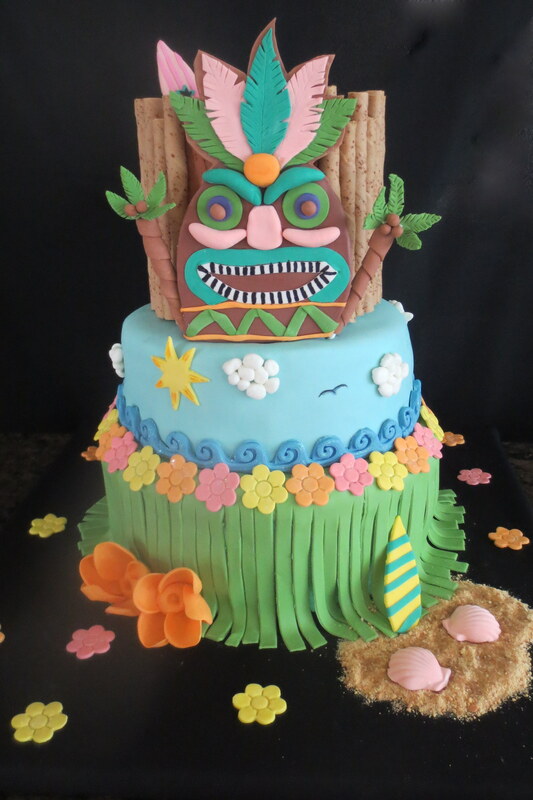 This looks like a great book–cool recipe too! The recipe looks delicious! I never read a book with this setting, I look forward to reading it. Thanks for the warm welcome, everyone! 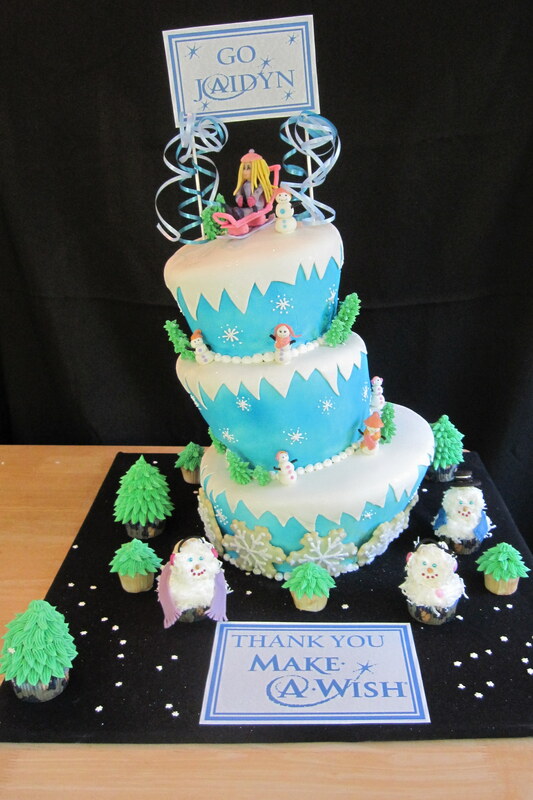 And thanks to Kim for hosting and reviewing. 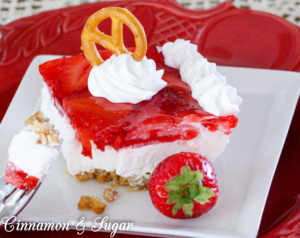 I have to say, her pretzel salad looks a lot prettier than the one I made! 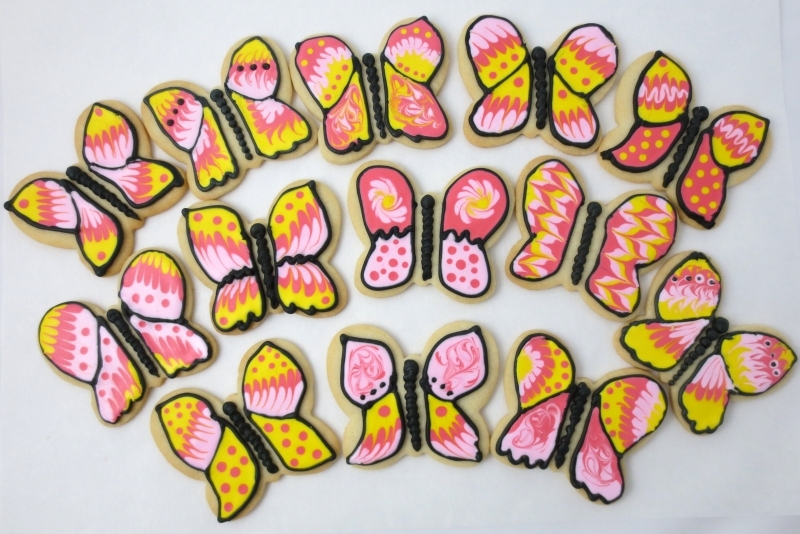 I’m making it for my book launch at Mystery Lovers Bookshop next Saturday, so I have to do better. If any of “yinz” (as we say in Pittsburgh) read the books, be sure to let me know what you think! 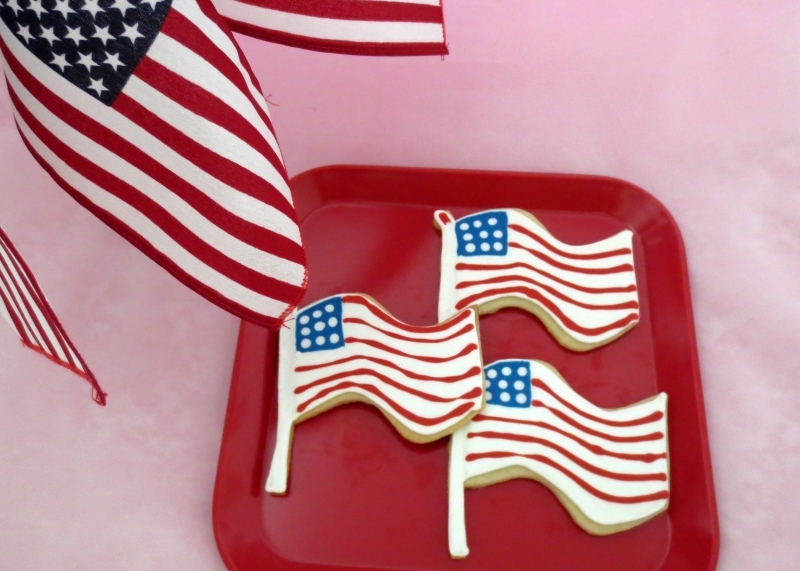 It’s my pleasure hosting your wonderful book and delicious recipe on my blog, Joyce! Thanks for sharing with us!! Great recipe & murder plot. Can’t wait to read more in this series. This is a new author to me and series to me. Sounds like a great read. Adding to my TBR list. I liked the first two books and now I’m looking forward to reading this next one too! This sounds like an interesting book. Can’t wait to read it. Can’t wait to read A Room with a Brew! Thanks for the chance to win a copy. This salad looks AMAZING! Of course I’m going to read the book! I love Joyce’s books! 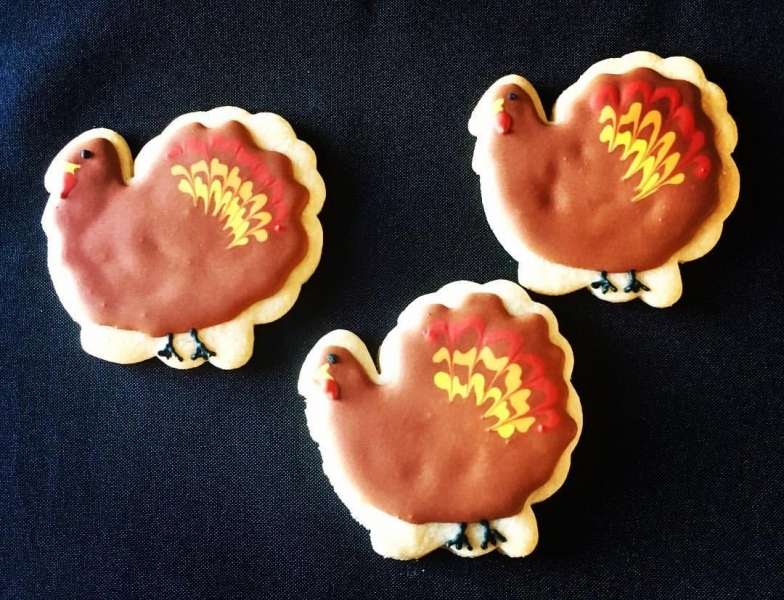 Thank you for the recipe, the review and the giveaway! Love the cover for A Room With a Brew ~ catchy title too! Can’t wait to read this, it sounds awesome! I love finding authors who are new to me. Thanks for the chance.